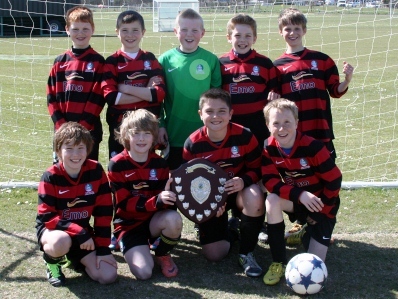 Congratulations to the school's football team on their recent success in winning the Aberystwyth Area Football Tournament. The tournament was held at Blaendolau fields with the boys winning every match as well as a close fought final. The final was so close the winners had to be decided through a penalty shootout. Well done you boys on your achievement. Congratulations to the school's netball team on their recent success in winning the Aberystwyth Area Netballl Tournament. The tournament was held at the Leisure Centre courts with the children winning every match during the afternoon. Many congratulations to four Year 6 pupils on their fantastic achievement in winning the 'Game 24' competition held for Aberystwyth Area schools. Dylan, Eleanor, Lisa and Peredur managed to win the challenge following weeks of preparations and playing the game at school. Best of luck to the four in the next round which will be held at Felinfach during next half term. Congratulations to both the boys' and girls' football teams on competing so well in the Urdd's football tournament which was held recently. The matches were held at Blaendolau fields, with the teams playing against Ceredigion county schools. Many thanks to the sponsors Emo Oil and FFIGAR Embroidery fod sponsoring the kits - they look very smart. Well done you children for training regularly and for representing the school once again. The Foundation Phase pupils had a lot of fun at the Morlan centre where they visited to watch the fantastic show 'Wcw a Swyn yr Ardd'. In the picture you will see the chwaratcers from the show along with pupils from the school. The children enjoyed joining in by measuring, counting, shouting and helping Wcw by singing! Many thanks to Wcw and his friends for organising the event. Congratulations to all pupils who competed in this year's County Eisteddfod, and well done to all who were successful. Best of luck in the National Eisteddfod in Pembrokeshire.